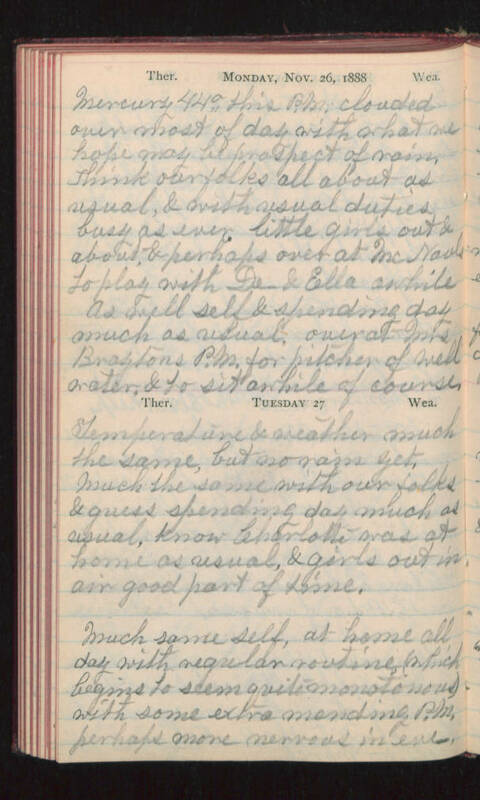 Monday, Nov. 26, 1888 Mercury 44° this P.M. clouded over most of day with what we hope may be prospect of rain. Think our folks all about as usual, & with usual duties busy as ever. little girls out & about, & perhaps over at McNaul's to play with De & Ella awhile. As well self & spending day much as usual, over at Mrs Braytons P.M. for pitcher of well water, & to sit awhile of course. Tuesday 27 Temperature & weather much the same, but no rain yet. Much the same with our folks & guess spending day much as usual, know Charlotte was at home as usual, & girls out in air good part of time. Much same self, at home all day with regular routine, (which begins to seem quite monotonous) with some extra mending P.M. perhaps more nervous in eve-.